Renault Wind: driven | What Car? 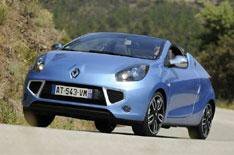 The Renault Wind is a stylish two-seater drop-top with sharp handling and a large boot. Occupants are well protected from buffeting and it's temptingly priced. It's closer to being a targa than a full convertible and the low-speed ride is jittery. The cabin is nowhere near as appealing as the exterior. The range-topping Wind uses a 131bhp 1.6-litre petrol engine that delivers lively performance when you rev it hard, but feels flat below 4500rpm. Those after a less frenzied driving experience are better served by the 99bhp 1.2-litre turbo model, which trades some outright pace for greater in-gear flexibility. With the roof down, you can feel some vibrations through the wheel, but, generally, the Wind seems impressively rigid for a convertible. Tight body control and quick steering make it fun to drive, too, although the steering doesn't provide much feedback. The ride is knobbly at low speed, but it settles down on faster roads. The engines aren't the quietest, but the 1.6 sounds pretty sporty, and every model is good at shutting out wind- and road noise when the roof is in place. Fold it away and, unsurprisingly, things get quite a bit louder, but occupants are well protected from buffeting as long as the windows are up and the wind deflector is fitted. The Wind undercuts rival coupe-cabrios such as the Mazda MX-5 Roadster-Coupe and Peugeot 207 CC by a considerable margin, and although it is more expensive than the entry-level Mini Convertible, Renault gives you more kit for your money. Running costs shouldn't break the bank, either, because the 1.6 engine averages over 40mpg and the 1.2 almost 45mpg. The Wind has a bespoke dashboard design (even if some of the fixtures and fittings are shared with the Twingo city car), but it still feels a little cheap inside. Not only are the plastics hard to the touch, but they look disappointingly drab. Renault's reliability record is patchy, although owners of the previous-generation Clio, which the Wind is related to, reported few mechanical problems. Stability control is fitted as standard, while twin front and side airbags are on hand in case of a collision. Security kit is also pretty comprehensive, with deadlocks, locking wheelnuts and a visible Vehicle Identification Number all included. Dynamique S models also have an alarm. Some people will struggle to find a comfortable driving position because the steering wheel doesn't adjust for reach and the seat controls aren't overly accurate. The top of the dashboard reflects in the windscreen on sunny days, too, and rear vision is awful. At least most of the controls are easy to use only the small and fiddly stereo buttons let the side down. The Wind's headline feature is a folding hard-top that swivels back through 180 degrees in just 12 seconds to leave the cabin open to the elements without stealing any space from the large, well-shaped boot. There's enough room for a couple of six-footers in the cabin and, although you don't get any rear seats, there is a handy shelf. Entry-level Dynamique models come with a part-electric roof (you have to lock it into place manually), electric windows, alloy wheels, cruise control, an MP3-player socket and air-conditioning. Upgrading to Dynamique S trim brings climate control, automatic headlights and wipers, remote stereo controls and Bluetooth. A smart and well-priced baby roadster that's fun to drive and practical enough to use everyday, albeit by only two occupants.